"The Man In White" is a standard, straight forward Yakuza movie directed by Takashi Miike. It lacks most of Miike's most known trademark elements, namely: excessive gore, the dark humor and the overall weirdness present in stuff like "Gozu" or "Ichi The Killer". Instead it builds up around one thread line, revenge. A theme that is all to familiar to the genre and has become more or less cliché to the point of no return. Even though this limitation, Miike once again demonstrates his unnatural ability of exploiting his resources to the maximum and turns "Man In White" from an average forgettable Yakuza flick to an entertaining but strong on character movie. After his boss is murdered by a hired hit-man. Asuzam known as a fanatically loyal, headstrong and merciless Yakuza sets forth to exact his revenge on the people responsible for his boss's death. Expect a large body-count, lots of hand to hand combat and shootouts as our main character plunges his way through the Japanese underworld in order to find the culprit. The story makes some interesting turns and at some point Asuza finds himself allied with the same person who killed his boss, fighting together against the people who paid for the assassination. The film tries to stay as morally ambiguous as possible, characters are well developed not just Asuza and the people on his side but also the hit-man and his companion. Their motivations and reasons become clearer and believable. Asuza is still the central figure though and his relationship with his now-deceased boss plays the most crucial role in the film. As it is the loyalty to him that drives Asuza on the path of revenge. The whole thing plays out very nicely, with a series of flashbacks and semi-dreamlike sequences that establish their relations. Miike has an ability to work with low-budgets we've seen that in dozens of his previous film. His limitations force him to improvise or search for alternative ways to shoot a movie. More or less this is what helps drive his creative genius, making some of the weirdest, brutal, darkly funny films. And while "The Man In White" lacks a bit on those trademarks of his, it still proves that he is creative with a low budget. Scenes are shot using different type of cameras. Where as the scenes at day time and indoors are shot in a traditional way, the scenes at night time are shot with a low pixel camera creating a grainy, raw look to the film. The whole feel is very urban, like watching a real hidden-cam documentary on yakuza activities. 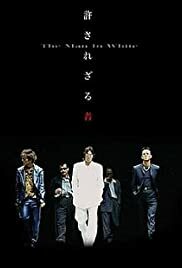 "The Man In White" is a pleasant little crime/revenge movie from Miike with a nice emphasis on character and story, decent action scenes and good camera-work. While not particularly a ground-breaking Miike film it still holds enough appeal to people who like his work or just yakuza movies in general to give it a shot.